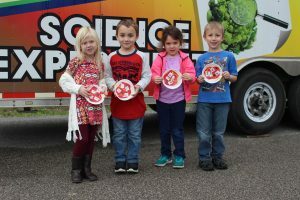 McNinch Primary kindergarten students Averi Chalk, Kaleb Gibson, Lindy McIntyre and Blake Broski show off “pizzas” they made inside the mobile lab. “Is There a Cow on My Pizza?” was the workshop they attended. The West Virginia Farm Bureau’s Mobile Agriculture Education Science Lab is parked at McNinch Primary School this week. The 40-foot lab is a fully-contained trailer equipped with multiple research stations. Michelle Bailey, WV Farm Bureau Mobile Ag Ed Science Lab Coordinator, and several volunteers guided the students while they conducted hands-on projects designed to meet WV Department of Education Next Generation Content Standard Objectives (CSOs). On Monday, Pre-K and kindergarten students participated in a lesson to see if there is a cow on their pizza. Each student was given a paper plate, which represented the crust, along with other paper “ingredients” to make a pizza. While many students thought there was no way a cow could be on their pizza, they learned there is a cow on their pizza in the form of cheese and pepperoni. Other lessons offered at the mobile lab included learning to read nutrition labels, discovering what snacks are healthier for their bodies and what food choices will promote healthy lifestyles. Some of the experiments included making “Glue from Milk” then comparing it to commercial glue, understanding the concept of environmental impact by making “Plastic from Corn” instead of petroleum and comparing natural and man-made superabsorbent products. The WV Farm Bureau was founded in 1919 to provide leadership, education, information, training and economic services to county Farm Bureaus to enhance quality of life for its membership. The group currently represents more than 16,000 members.